If you ever find yourself in the market for a jet airliner, it might be interesting to know you don’t need to buy the engines outright. Instead, companies like Rolls-Royce and GE will let you pay for them per hour of use. It’s an example, albeit an extreme one, of a manufacturer converting a product into a service. Such conversion, often referred to as “servitization”, is on the rise, especially in the IT domain. Where once companies would invest heavily in complex software products and the supporting infrastructure, today they buy software-as-a-service (SaaS). Here we’ll look at what servitization means and why it’s on the rise. We’ll discuss implications both for buyers and sellers and conclude with some thoughts on where this trend might lead. People often buy things they don’t need, not necessarily by choice but because it’s unavoidable. Products are designed to appeal to as many potential customers as possible. To maximize customer appeal, engineers (and often, marketing teams) like to cram in features. Few customers need all of the features, though they end up paying for functionality they may never use. That’s one reason behind the rise of “everything-as-a-service” (XaaS). A second is that ownership often incurs unwanted costs. Floorspace, storage, maintenance and so on. Buying services rather than products enables businesses to pay only for what they need while avoiding the associated overheads. XaaS uses the Internet to serve up computing and storage resources to remote locations. The actual computing application resides on a remote server that’s considered to be “in the cloud.” This highlights that few users will know where it is, and in any case, most will never need this information. High-speed bandwidth connectivity is essential to the success of such cloud computing. Access to the XaaS application is granted for a monthly fee. Thus what was capital expenditure becomes an operational expense. In addition, operators of larger server “farms” – which include Microsoft, Google and Amazon – can generally run these more efficiently. Growth of XaaS has mirrored that of the Internet, and in particular, high-speed connections. Many software tools and products have moved to the cloud, becoming services in the process. Among the most widely used are online backup/recovery services, productivity tools, and web and email hosting. 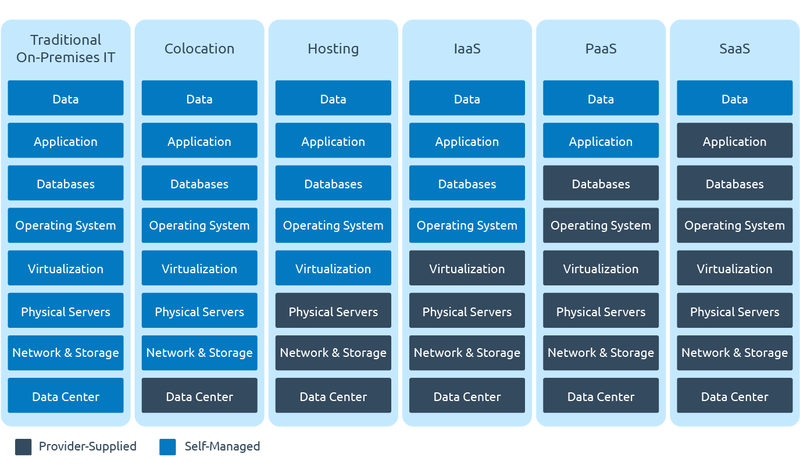 Today, in addition to SaaS is Platform-as-a-Service (PaaS) and Infrastructure-as-a-Service (IaaS). You may also see other terms used to describe servitization of what were once products. The difference between these XaaS models comes down to how much control the end user retains. For example, in a SaaS model, the user or customer typically only manages the data, leaving databases, operating systems and servers to the provider. Move to IaaS, though, and the end user handles databases and operating system with the provider taking responsibility for physical servers. XaaS generally reduces total cost of ownership. Users can reduce, even avoid, expenditures on servers and their associated upkeep and maintenance. However, this isn’t always the biggest driver. Many companies that move to XaaS cite data availability, disaster recovery capabilities and better data security among their motivations. The most common concern with regard to XaaS is data security. Providers counter that it’s easier for them to provide security than it is for end users, and they note that they can also do so more effectively since this is their core business. A second issue is bandwidth. As the volume of data exchanged with the remote server increases, it is essential that speed not be compromised. However, this can also be countered with improvements in bandwidth, latency and data storage capabilities via integrated services. Switching from in-house provision to XaaS offers service buyers many benefits, but there is another aspect to consider; can the products being manufactured be sold as a service? This is the approach taken by Rolls-Royce and GE with their Power by the Hour program. It might be argued that businesses such as General Motors are also exploring their XaaS provider options with services such as Maven car-sharing. Companies are already moving toward cloud-based systems for running their businesses, but what of other functions? High-performance computing is a clear candidate for tasks like simulation, and other R&D/engineering software is moving in the same direction. Supply chain management is also shifting this way, and so too are SCADA systems used for plant operation. Even automated inspection tasks are moving cloud-wards, driven by the computing resources needed for deep learning and artificial intelligence applications. Perhaps it’s time to evaluate your XaaS options.